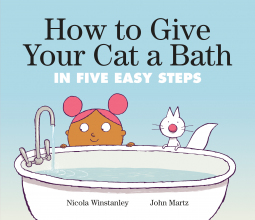 An aMewsing title: How to Give Your Cat a Bath by Winstanley – Joyce's mystery and fiction book reviews with some non-fiction too! Children who have cats as pets and/or adults who do will find this book to be fun and amusing. A little girl wants to give her cat a bath…we all know that cats are not on board for that. Read what happens while enjoying the illustrations in this quick story book read.